Easter is right around the corner and I am just now starting to find goodies for my kiddos Easter baskets. I have some ideas. Last year I was so fortunate to work with so many amazing companies that their baskets kind of fell together. This year is different. I want to continue to give them items that are meaningful and they can use over again. I have worked with ISeeMe! in the past and absolutely love their personalized children's books. I decided to get Dinosaur Egg Hunt for my son since he doesn't have as many personalized items, loves dinosaurs, and since they are on an egg hunt I felt it was a great Easter basket addition. In this personalized book, authored and illustrated by children’s book veteran Bob Barner, your child becomes a paleontologist on the hunt for fossilized dinosaur eggs. Young readers will delight in learning about different dinosaurs and their eggs found around the world. My daughter has many books from ISeeMe! and absolutely loves seeing her name whenever it pops up. Her favorite is her Princess Personalized Book. Easter Sale! Save 30% OFF! Use code EASTER30 at ISeeMe.com, sale Ends 4/9/17. ISeeMe has tons of other products to offer as well; Lunchboxes, Puzzles, Coloring Books, Placemats, Stickers, and Growth Charts. Something for everyone and every occasion! 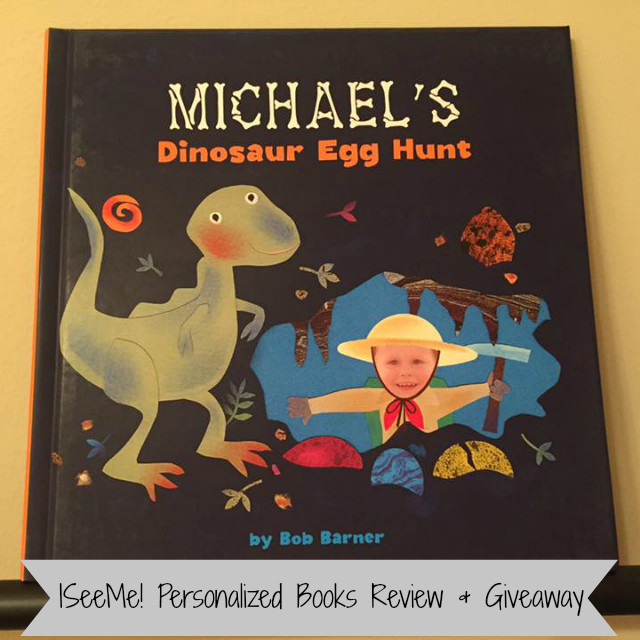 One lucky Nanny to Mommy reader will win the Dinosaur Egg hunt Personalized Book from I See Me! Entry is simple, just follow the prompts on the Rafflecopter below. Open US only, must be 18+ to enter. Winner chosen via Random.org through Rafflecopter. All winning entries are verified. Please follow us on Facebook to stay up to date with our current giveaways. Good luck! Nanny to Mommy received complimentary products to provide this post. All opinions are my own. This post contains affiliate links. Facebook, Twitter, Pinterest and any other social media are not affiliated with this giveaway. 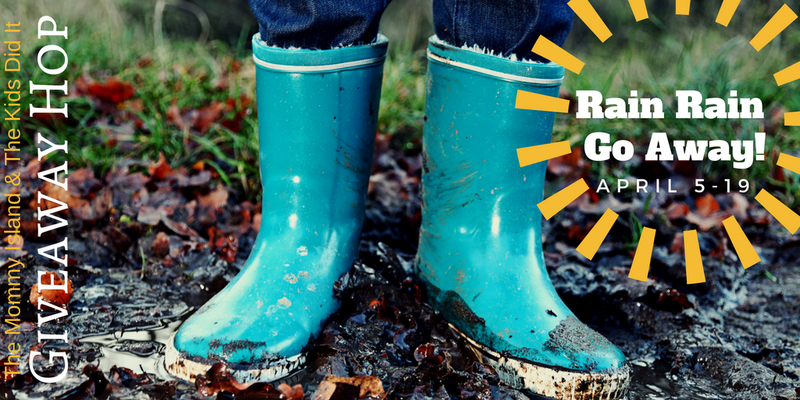 Nanny to Mommy and participating "Rain, Rain Go Away!" Giveaway Hop bloggers are not responsible for sponsors who do not fulfill prize obligations. This giveaway is open to US only, must be 18+ to enter. Cannot be shipped to P.O. boxes. One entry per household/IP address. No social media was involved in this giveaway in any way. Winner is chosen via Random.org through Rafflecopter. ALL winning entries ARE verified. Winner will have 48 hours to respond with all information in email or another winner will be chosen. If you would like to see your product featured on our blog or sponsor a giveaway event, please contact us. I love the Outerspace Personalized Lunch Box!! Its super cute and would be perfect for my son! I really like the Find Me! Personalized Seek-and-Find Book! I would give this book to my son for Christmas if we won! He would love it! I would love the 1-2-3 Blast Off With Me Personalized Book, my son would love seeing himself in the book! I like the Find Taylor book for my son. Grandson Ashton that is only 2weeks old. WHO LOVES ME? personalized book! I would love to get God Loves You! Personalized Book. This will e a great gift for my new baby cousin who was borned 2 months early. I would like My Very Own FAiry Tale with the Wand Set and it would be for my great granddaughter, Kaitlyn. I would love to get my nephew his own My Pirate Adventure Personalized Book book. I would love to get my granddaughter the My Snuggle Bunny Book, Bunny and Placemat Gift Set. She would absolutely LOVE it! She is 4 years old, and they all love to read about themselves! I like to tell her the story of when she was born. God bless all! I also love It's Fancy to be Sophia, I would give that to my Granddaughter and this book I want for my Grandson. These books look adorable! 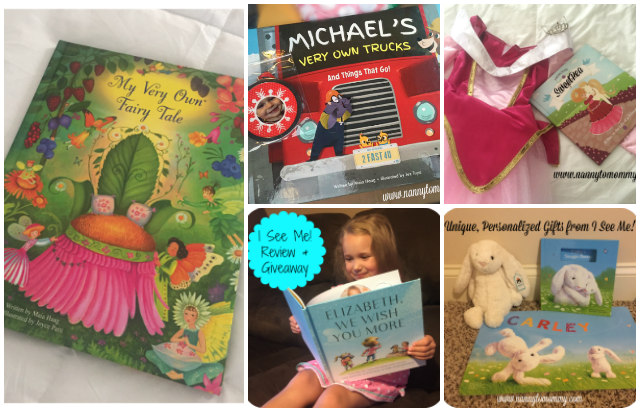 I think they'd make a great gift- thank you for sharing about them and for the giveaway! I like the personalized music book and cd. My baby cousin would love it. I like their super-bestest grandparents book! I think the Who I Love book looks great!! My Very Own Name book would be for my great granddaughter, Kaitlyn. She loves birds and would love her name in a book. My favorite book to give parents with newborns is Who Loves Me?. ISeeMe is a fantastic site! I love the i see me books. I really like the find me book. Fun! I like the My Pirate Adventure Personalized Puzzle. I think that the Dino-Mite Personalized Lunch Box is cool! I would love My Very Own Fairy Tale for my youngest, Niece, Kenzie. I would get the My Very Own Fairy Tale Storybook for my daughter!